What is Taraweeh? 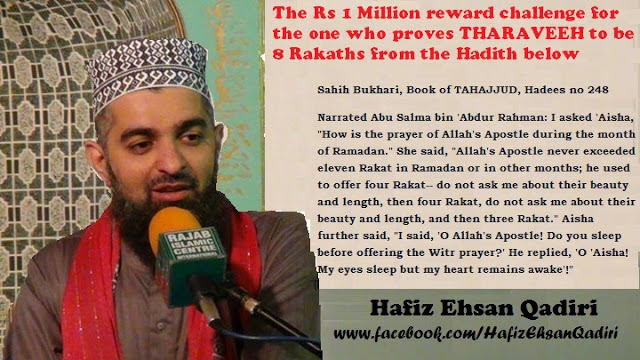 How Many Rakats are there in Tarawih (Night Prayers of Ramadan)? How to Perform Taraweeh Salat? What is SALAT AL-TARAWEEH? Watch this video to get all your answers by Renowed Islamic Scholar Hafiz Ehsan Qadri. This video will tell you the reality of How many rakats of Namaz (Taraweeh 8 or 20) to pray? How to pray and How our beloved Prophet Muhammad Sallahu Alaihi wa Salam Prayed. Narrated Abu Salma bin 'Abdur Rahman: I asked 'Aisha, "How is the prayer of Allah's Apostle during the month of Ramadan." She said, "Allah's Apostle never exceeded eleven Rakat in Ramadan or in other months; he used to offer four Rakat-- do not ask me about their beauty and length, then four Rakat, do not ask me about their beauty and length, and then three Rakat." Aisha further said, "I said, 'O Allah's Apostle! Do you sleep before offering the Witr prayer?' He replied, 'O 'Aisha! My eyes sleep but my heart remains awake'!" 1. The Hadees is recorded by Imam Bukhari Alaihir Rahmah in the Chapter of Tahajjud, so to prove Tharaveeh from above is incorrect. 5. The Blessed Heart of Allah's Habeeb Sallallahu Alaihi Wasallam is always awake and engrossed in the remembrance of Allah Tha'ala and everything on the universe is apparent to The Most Beloved of Allah, Sallallahu Alaihi Wasallam. What are the ways you may accept the challenge. Contact us through any of the following pages & we will agree upon a Date/Time & a Venue. Wish the challengers all the very best! During the month of Ramadan, aside from the praying of wit’r the beloved Prophet SallAllahu Alaihi wa Aaihi wa Sallam would also pray 20 rak’ahs of Tarawih.